In his January 2018 article published by Harvard Health, Dr. Peter Grinspoon enumerated marijuana’s many benefits to man – from getting rid of anxiety to curing arthritis to even pain management – the plant that is being considered by many as a “wonder drug” surely enjoyed its place in the limelight. However, while cannabis is now becoming legal in select countries, its medical use is still limited to humans. Pets, on the other hand, while reportedly getting positive results, still do not enjoy the same legal status as that of their human counterparts in terms of its use as an alternative medicine to treat illnesses. In addition, there are very few studies that could support the plant’s benefits to our furry pals. As such, pet owners are putting matters into their own hands and are giving pets medical marijuana as an alternative treatment to common pet diseases. First, let’s get acquainted with the plant. Marijuana used to be illegal, schedule I drug but has recently gained popularity in terms of its medicinal wonders. The plant contains more than 113 cannabinoids – one of which is Cannabidiol (CBD). It is this CBD that does miracles to humans suffering from common illnesses like arthritis to complicated cancer symptoms. In the UK, CBD oil is legal since last year. It is regarded as an alternative medicine and can be purchased freely all over the country. There is, however, another compound that is present in the plant that can affect the oil’s legal status. This is called the Tetrahydrocannabinol (THC) which causes the usual “high” users experience when smoking weed. It is said that in the UK, CBD oil with up to 0.2% THC content is still legal. Anything that has THC content of more than that will get you in trouble. Unlike in the US where vets do not necessarily have 100% freedom to discuss, much more prescribe CBD to their patients, the UK has loosened its belt in its treatment of the CBD oil as medicine. Just this September 2018, the Veterinary Medicines Directorate (VMD) – an organization that regulates the manufacture, sale, prescription and use of veterinary medicines in the United Kingdom declared that veterinary products that have CBD content are considered as veterinary medicines. The declaration puts more freedom in the hands of vets in the UK to prescribe CBD to their patients more than the vets that are in the US. As we obviously should know, the dosage given to humans should be different from that of the animals. Due to biological differences, pets can only tolerate certain amounts of compounds that are taken in by their bodies. This is the same with CBD oil. The amount of oil that is ingested by your pet should vary depending on your pet’s size and weight. Too much oil that is taken in can lead to overconsumption and may intoxicate your furry friend. As such, it is critical that before giving your pets the CBD oil, how much should be consumed and the frequency of the dosage must be clarified with the vet. While CBD oil is known for its many benefits to man and animals, it should also be remembered that the latter can still get high. If you are not careful enough, your pet may accidentally consume more than what is needed. This may lead to intoxication and overdose of the compound. 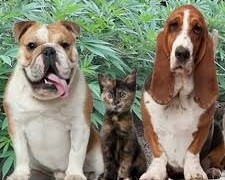 Other ways when pets can get high would be when you smoke weed in front of your pets in a closed room or if your pet accidentally consumes your marijuana stash. And so just like medicines should be kept out of reach of children, you should also do the same with your marijuana stash. You must keep it away from the reach of furry friends and other pets. Second-hand smoke is bad. Whether it is cigarette smoke or smoke from weed, inhaling weed smoke may have adverse effects to your pets. One should remember that animals have very sensitive lungs. While second-hand weed smoke may not have that much of a negative impact on humans, it is a different story altogether when it comes to pets. Smoking weed with a pet in a closed room (or even with windows opened) can result in the pet’s intoxication. So how do you give your pets CBD? There are many ways of ingesting the compound. There are CBD tinctures which can be administered through bottles and droppers, CBD topicals in a form of ointments, creams, and lotions or CBD edibles that come in different shapes, flavors, and sizes and may look like treats. cannot deny the benefits humans and animals get from taking in the compound. While there are biological differences between humans and animals, we cannot deny that pets also suffer the same illnesses as that of humans. Pets can also feel pain; they also have seizures, spasms, arthritis, or even cancer. In fact, pets get depressed, too! And so if CBD works well with humans, it certainly is effective to pets as well. It may be a matter of a difference in terms of dosage but what the humans can ingest, the pets can take in as well. The world still needs some getting used to when it comes to CBD as an alternative medicine. There is still much debate and research on the medicinal benefits of cannabis and its compounds. Because there is still too much to discover about the medicinal properties of the plant, giving marijuana as medicine is a decision that needs further thinking. Aside from risks of overdose and other effects, there is also the law that you still must put into consideration. Remember that the world has not yet fully embraced the good things the plant has brought to the table. It is best to always take extra precautions – not just for the sake of your pets but for yours as well.